The loop of Henle carries filtrate from the proximal tubule to the renal medulla and back to the renal cortex. There are three functional divisions: the thin descending limb, thin ascending limb, and thick ascending limb. The thin descending limb of the loop of Henle has leaky “tight” junctions. This allows water to leave by passive diffusion as the tubule segment enters the hypertonic renal medulla. In addition, urea and Na+ diffuse from medullary interstitial fluid into the lumen of the tubule. The thin ascending limb of the loop of Henle is distinguished from the descending limb in that the tight junctions are now “tight” and water impermeable. As the name suggests, at the transition from descending to ascending, the tubule segment makes a 180-degree turn and the filtrate is now being carried back toward the cortex. The epithelia of the thick ascending limb of loop of Henle also contain “tight” tight junctions. The most important transport protein in this segment is the apical Na+/K+/2 Cl– transporter, which can be blocked by furosemide or bumetanide. 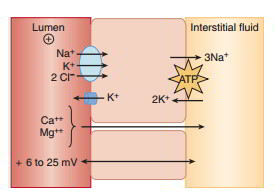 The back-leak of K+ across a channel on the apical surface causes a lumen-positive (6 to 25 mV) transluminal potential. This transepithelial potential then drives the paracellular absorption of calcium and magnesium. The solute transport without water movement results in a drop in the filtrate osmolarity to 100 mOsm, so the ascending limb of the loop of Henle is sometimes called the diluting segment. The solute transport into the interstitial space without water movement also is one of two mechanisms causing hypertonicity of renal medullary interstitial fluid.